For centuries the Stirling Bridge divided north from south, Highland from Lowland. William Wallace and Robert Bruce fought their most famous battles here, and Bonnie Prince Charlie's Jacobites besieged the ancient seat of his Royal Stuart ancestors, Stirling Castle, in 1746. NOTE: Due to unforseen circumstances the Old Town Tour is cancelled for remaining dates in August, but WILL resume weekends in September. But there's more to the Royal Burgh than Kings and conflicts! On the Old Town Tour you'll discover the strange, scary (and sometimes just plain silly) secrets of those who once walked our streets...from Jacobites and Roundheads to grave-robbers, Kings and Covenanters! Ancient curses, bloody battles, sieges and slaughter...and all within a few minutes walk of some of the Old Town's most spectacular locations! 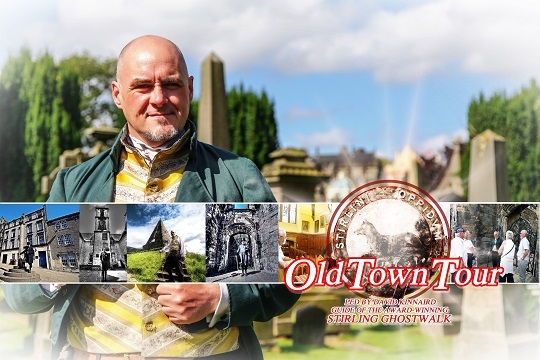 Your guide is David Kinnaird, actor, author and The stirling GhostWalk's notorious 'Happy Hangman'!